When Autumn brings the cooler weather, it summons within us all the desires for earthy, harvest foods. But that much more so when you’re sitting outside in your sukkah in mid-October – it takes an effort to warm yourself up on some pretty chilly nights. The holiday of Sukkot takes us out to the elements. It reminds us of our human vulnerability and the reality of Whose shelter we dwell in in the larger sense. 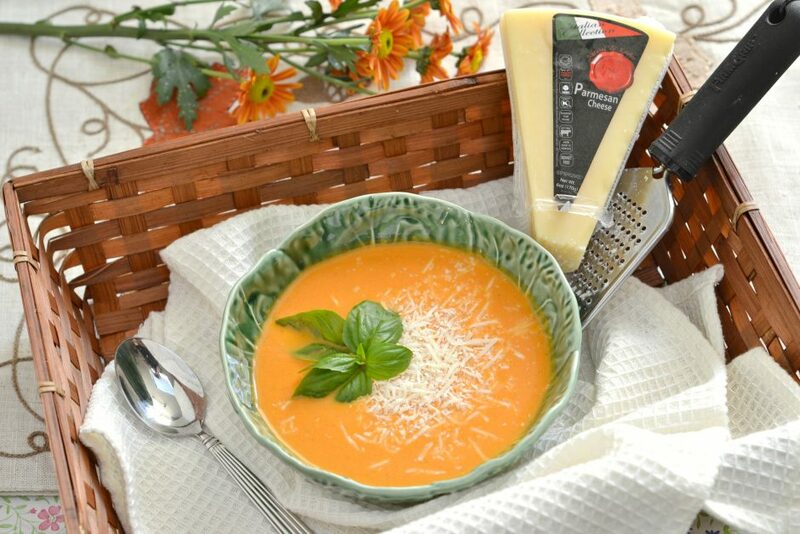 So grab your favorite sweater and get some soup on – hot soup in a cold sukkah is the way to go! Have you ever made roasted red peppers? If not, I highly recommend making it a New Year’s resolution to try them this year. They are super easy to prepare and are such a phenomenal way to pack a culinary punch of flavor into your dishes. Think of them like a blank canvas, a versatile building block with tons of concentrated flavor waiting to burst. Throw them into salads, grain dishes, or use them as the base of a sauce or soup. Oh, and best part: you can prepare a bunch and store them in a jar covered in olive oil (I store with garlic slivers too), and they will last up to 2 weeks in your refrigerator that way…your own DIY jarred peppers. Use the instructions for how to prepare them in the soup recipe below. Try this delicious dish for your sukkah…or anytime of year! Chag Sameach – enjoy the holiday! 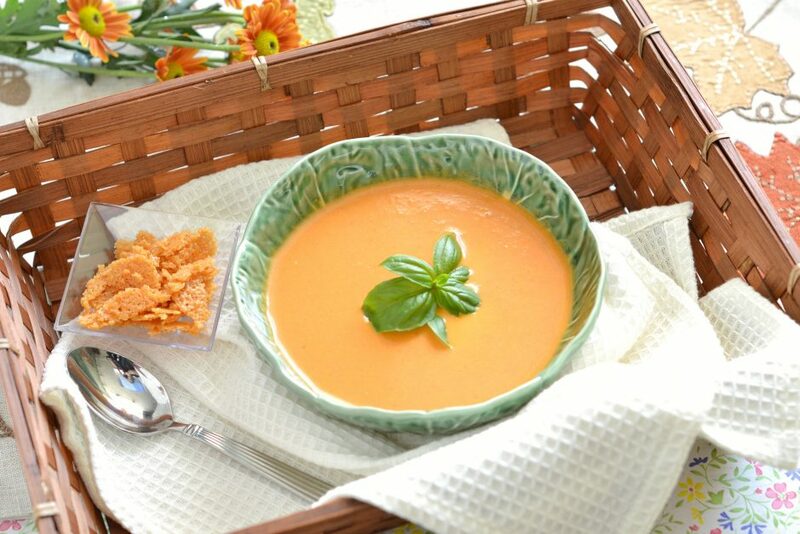 Roasted red peppers provide a super-flavorful zing to this soup, perfectly balanced by the creaminess of layered parmesan cheese – both in, on top, and as an accompanying Parmesan Crisp (recipe below). I love roasting fresh peppers for this soup, but jarred roasted red peppers will also work in a pinch. Preheat oven to 500°F. degrees. Place the peppers on a foil-lined baking sheet and brush the insides of the pepper halves with 2-3 tablespoons olive oil. Sprinkle with salt. Arrange peppers cut-side down on sheet; roast the peppers in the upper third of the oven until the skin is charred (yes, black spots are a good thing) and bubbling, about 15-17 minutes. The flesh will be tender when pierced with a knife. Remove from oven. Cover with foil, and allow to cool for 10 minutes. Peel and discard skins. Coarsely chop peeled peppers and set aside. Heat remaining olive oil in a Dutch oven or large pot over medium-high heat. Add onion, celery, and salt, sautéing until translucent, about 5-6 minutes. Add garlic and sauté for 1-2 minutes more. Add tomatoes and reserved peppers, stirring occasionally for 3-4 minutes. Add stock/water. Bring to a boil, then lower to a simmer. Cook covered for approximately 15-20 minutes or until vegetables are tender. Add wine, basil, and ½ cup grated Parmesan. Stir to blend; cook for an additional 2-3 minutes. Puree soup in batches in blender or food processor (or use an immersion blender to puree in the pot). Add cream, whisking to blend. Season to taste with salt and pepper. Add additional stock or cream if soup is too thick. To serve, heat gently (do not bring to a boil). Serve hot, topped with remaining Parmesan and Parmesan Crisps (recipe below). Place 1 tablespoon mounds of cheese 2 inches apart on the prepared baking sheet. Bake for 5-6 minutes. Cheese should appear flattened into golden crisps. Remove from oven and allow to cool. Crisps can be used as whole discs or broken up.